Puxatawney Phil may have said that there are 6 more weeks of winter, but where has winter even been? Monticello has been basking in the sun all of February as the West Lawn glimmers from the light in the seventy degree weather. Even though we may not be experiencing a true winter here in Charlottesville, you can always get into the spirit by cooking with fresh ingredients that are in season. The leek, bundled “leaf sheaths” with a mild oniony flavor, a relative of the onion and garlic. The thick sheaths almost resemble celery stalks and make the leeks very hard to clean. Depending on how you plan on using and preparing the leeks, make sure you take the necessary steps to fully clean the leek. 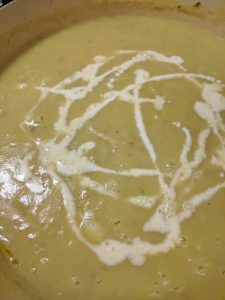 Instead of sitting by the warm fire place, enjoy a nice day outside with a classic bowl of potato leek soup. This recipe serves 6. Slice off the root ends of each leek and cut the stalk into 1-inch chunks on a diagonal. Discard all tough stalks (dark green) and dispose of the dark green tops. Put all sliced leeks into a large bowl of water to remove dirt. Heat the oil in a large pot over medium heat. 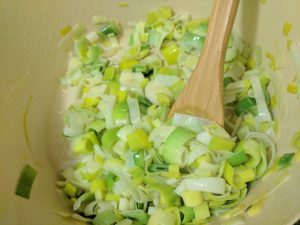 Add sliced leeks. Stir occasionally for 8-12 minutes until vegetables soften and brown slightly. Add chopped potatoes, veggie stock and spices to taste. Here I used fresh rosemary, sage, some ground thyme, bay leaves, salt and pepper, and a dash of cayenne pepper. 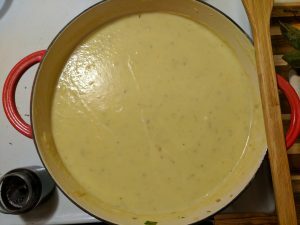 Bring it to a boil, then reduce heat to low and let the soup simmer for 30-40 minutes or until the vegetables are tender. 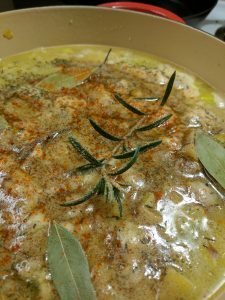 Make sure to fish out the sage, rosemary, and bay leaves before moving on. 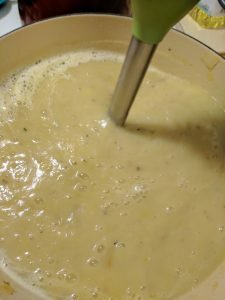 Blend contents until smooth in an immersion blender or by transferring the vegetables to a blender in batches. Add the cream to the blended contents and season to taste with salt and lemon juice. Serve with a dollop of crème fraiche and a sprinkle of parsley .